Somalia is one of those developing countries which end up in world media for all the wrong reasons: civil war, famine, drought, Somalian pirates are to name a few. 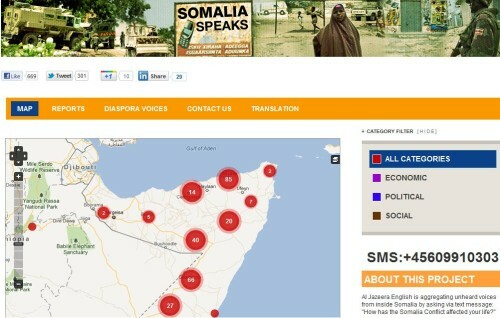 With the help of an Ushahidi based platform “Somalia Speaks“, Al Jazeera English is aggregating unheard voices from inside Somalia via SMS. The responses are translated into English and finally plotted onto a map. People can also send in a report via SMS to an international number and submit comments online including video links, photo uploads, and text descriptions. 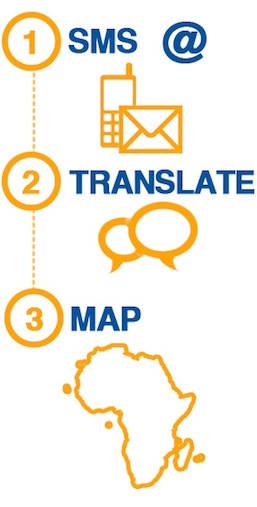 Somalia Speaks is a collaboration between Souktel, an NGO providing SMS messaging services, Ushahidi, Al Jazeera, Crowdflower, and the African Diaspora Institute. Souktel sent out the question “How has the Somalia Conflict affected your life?” in Somali language to about 5,000 of their subscribers in geographically disbursed areas. Somalia Speaks received over 3000 replies in text messages, which were translated, categorized and geo-located using this crowdflower plugin. Co.exist reports quoting Riyaad Minty, Al Jazeera’s head of social media, how the crowdsourcing works. There were amazing responses from the online Somali-speaking community, who volunteeed to translate the sms reports. The mapped reports are also linked to a public discussion forum where readers can respond and share their views. 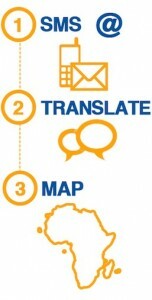 A reader, Awaale, commented at Ushahidi blog that people in Somalia understand that SMS is between just two people. So they may respond to the Souktel SMS without knowing that their name will be displayed in Internet exposing themselves to the warlords. He was replied with an assurance that the Al-jazeera team had deleted all personal identifiers from the public site. Mobile Media Toolkit has a complete case study on this project. Please do not submit information to Somalia Speaks. They are putting the names of the Somali people on the website where they can be seen by everyone. People in Somalia are in danger, and now they are trying to leave Somalia after finding out their complaints and their names were made public.